Many dog lovers mistakenly feed their pups grapes and raisins as an easy-to-chew treat. These snacks are actually very toxic for your pup and can cause kidney failure. 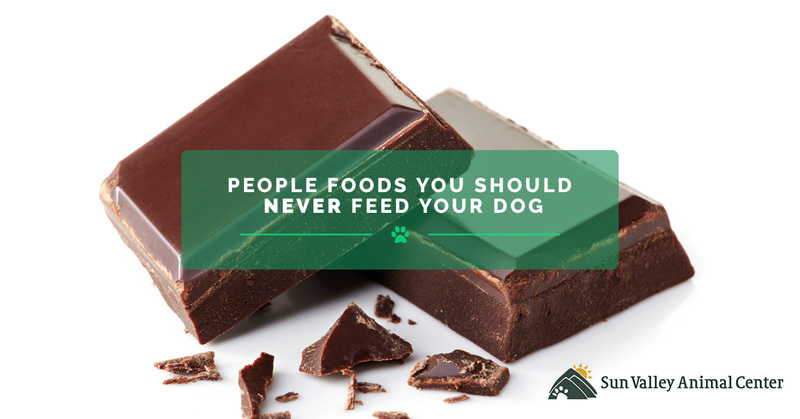 While the toxic substance that causes canine kidney failure is still being researched, it is best to avoid sharing these treats with your dog. Make sure to keep grapes and raisins stored in an area that is inaccessible to your dog. Avocados contain persin, a fungicidal toxin that is mildly poisonous to dogs. While avocados are not as toxic to pups as some other foods, they can cause vomiting and diarrhea, which can dehydrate your dog and decrease their energy levels. The most dangerous aspect of the avocado is the pit which presents a choking hazard to your dog. It’s best to dispose of the pit in a wastebasket that your dog cannot access. Additionally, if you grow avocados at home, make sure your dog can’t get to them. With Halloween just around the corner, chocolate candy will be a common feature in households across the country. Chocolate contains a substance called methylxanthines found in the cacao seeds used to make chocolate. While dark chocolate contains the highest level of this toxic substance, milk chocolate and white chocolate contain lower amounts. If your dog ingests chocolate, it can cause vomiting, diarrhea which leads to dehydration and excessive thirst. Additional symptoms include heavy panting, frequent urination, shaking and tremors, hyperactivity, rapid or abnormal heart rate, seizures, and in the worst case, death. It’s best to keep all chocolate and chocolate products stored in high, secure places where your dog can’t reach it. Be extra mindful about where candy bowls are placed around the house this holiday season. These staple foods are commonly found in kitchens, but should never be given to your pup. Garlic and onions contain enzymes which cause gastrointestinal issues that can wreak havoc on your dog’s red blood cells. Some recommend using garlic as a flea deterrent, but this simply does not work and should not be a part of your dog’s diet. It’s best to avoid these feeding your pup these foods altogether. If your dog needs immediate care for ingesting a toxic food, call us immediately. If you have questions about your dog’s diet and would like nutrition guidance, contact Sun Valley Animal Center, the nation’s Top Rated Local® veterinary hospital and animal clinic, where your pet’s health is our main priority. Like our blog? Follow our blog and read our monthly posts for news about our veterinary hospital services, interesting articles, and health and wellness tips for your pet.